This free service from ATS Acoustics will analyze aspects of the acoustics in your room using readily available dimensions and surface information you provide. It's primary purpose is to determine how much acoustic treatment is needed in your room. Each room is different. This report takes the most important differences into account so you get an accurate result. You can view your report online in minutes. If you have any questions or you want to talk to one of our representatives about what your room needs, please chat with us or call us toll-free at 1-866-787-7881. Identify your room and it's purpose. Enter the dimensions of your room. Provide information about the surfaces in the room. Receive your customized report and recommendations. 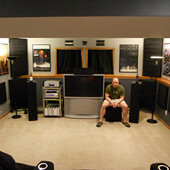 They look great in my AudioNirvana room, and if I can install them, just about anyone can!